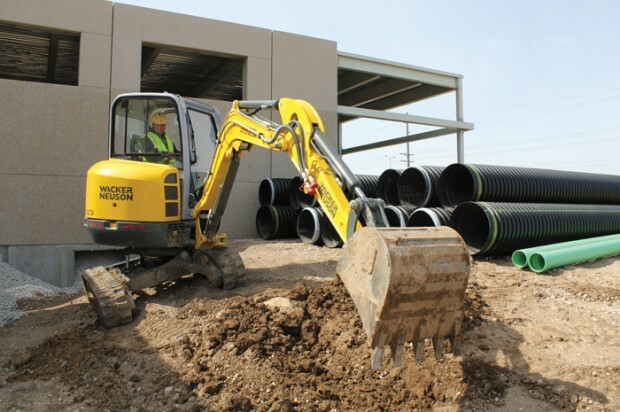 Wacker Neuson only began offering excavators to the U.S. market in 2008, but it was one of the first companies to introduce mini excavators to the European market more than 30 years ago. Wacker Neuson was the first manufacturer to launch an 8-ton “mini” with the typical mini excavator features like rubber tracks, a dozer blade and boom swing. Mini excavators have always been a core product for the company, launching its 12th model into the North American market this summer. There are currently 11 track excavators in the Wacker Neuson lineup in the 8-ton-and-smaller range. The smallest model available is the 1-ton 803 excavator. With a 13-hp Yanmar engine and the highest auxiliary flow rate in its class, this mini excavator delivers best in class digging and demolition performance, says the company. Wacker Neuson recently introduced their Dual Power version of this machine, which works either with the standard diesel engine or a separate electro-hydraulic pump. The Dual Power system allows the machine to operate emissions-free. Wacker Neuson offers three zero tail swing mini excavators. The 28Z3, 38Z3 and 50Z3 all are available with the unique Vertical Digging System (VDS). The VDS system compensates for height differences on uneven terrain and quickly sets the operator in an upright position, greatly increasing productivity by letting the operator complete the job done instead of struggling against the terrain. This innovative system enables operators to tilt the excavator with a simple push of the button and results in up to 25 percent material and labor savings, improved stability and operator comfort, says Wacker Neuson. The VDS system is also backed by a 10-year warranty on all VDS components. The 2.8-ton EZ28 is popular with landscaping and residential contractors since it is light and compact enough to be hauled with a standard size pickup and trailer. The 3.8-ton EZ38 is also highly maneuverable and compact, but offers more power and digging depth up to 11 ft. The 38Z3 is also available with air conditioning for increased operator comfort. Taking on larger jobs is the 5-ton 50Z3, which features the largest cab in its class, says the company. The 3.5-ton 3503 is a conventional tail excavator and is a mid-range machine. The largest of the track excavators are the 6003 and 8003, which feature a short tail design. These larger machines provide increased productivity with more power, dig depth, dump height and the ability to handle large objects like concrete pipes. The Wacker Neuson wheeled excavators were just recently launched in North America and are available in a 6.5- or 10-ton model.